“In football, unlike bullfighting, there is no death. In football no one dies; no one gets killed.” The tragic story of Andres Escobar. On 23rd June 1994, during the World Cup tournament in the USA, Escobar was playing for the highly-fancied Colombians against the hosts in their second group game. Following a qualifying tournament of 26 matches wherein they had been beaten on only a single occasion, culminating in a glorious 5-0 victory against Argentina in Buenos Aires, Francisco Maturana’s squad had even been tipped by the great Pele as genuine contenders to win the tournament. After losing their initial encounter to a Gheorghe Hagi-inspired Romania, the South Americans were strongly fancied to win and get their campaign back on track. Those qualifying matches were to prove a false dawn however, and Pele’s predictions somewhat wide of the mark. After initially peppering the USA goal and dominating the match, events took a dramatic turn. Ten minutes before half-time, with the scores still tied at 0-0, former Sheffield Wednesday and Derby County midfielder John Harkes crossed the ball from the left. Escobar patrolling the Colombian box, and aware of the potential danger of an American player lurking behind him, slid in to try and block the cross, but only managed to divert it past Oscar Cordoba in the Colombian goal for the first – and last – own goal of his career. The Colombians spirit appeared broken, and the Americans added a second before a late Valencia goal provided no real consolation at all. A 2-0 victory over Switzerland in the final group game was a low key affair, with both teams eliminated already. Back in Medellin, as Escobar’s errant intervention rolled into the net, Felipe, his nine year-old nephew, following the game from Pasadena on television, turned to his mother and said, “They are going to kill Andres.” The child’s mother calmed her son. “’No sweetheart, people aren’t killed for mistakes. 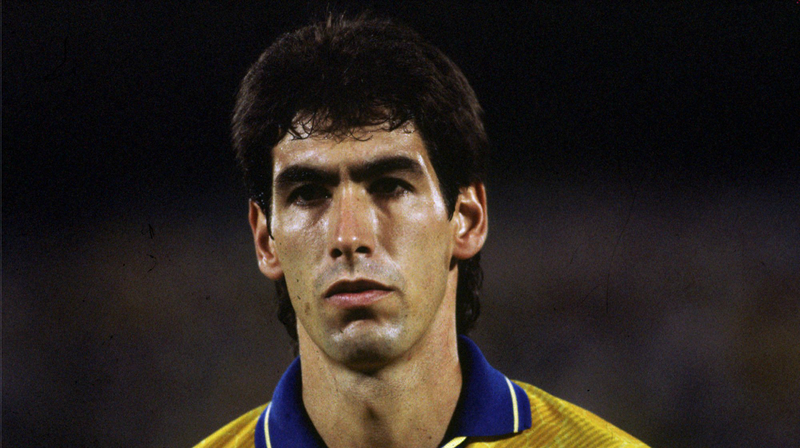 Everyone in Colombia loves Andrés.” Less than two weeks later however, little Felipe was proved chillingly correct as Andres Escobar lay dying in a car park with multiple gunshot wounds. Fast forward precisely twenty years to 2nd July 2014, and the World Cup is again hosted in the Americas; this time, south of the Gulf of Mexico in Brazil, and for Colombians all roads lead to Fortaleza. A couple of days ahead of Colombia’s latest ‘golden’ generation’s day of destiny in a quarter-final match against Brazil it was difficult not to reflect on the poignancy. Escobar would now have been 47. When he was killed, he was due to move to AC Milan for the following season and was engaged to be married. Now, 20 years after his death, it was rumoured that many Colombians were carrying a picture of their late captain – the man simply known as ‘El Caballero del Futbol’ (the Gentleman of Football) – with them to the match as an act of homage to their fallen hero. Star of the country’s new generation – James Rodriguez. It was the first time that the Colombians had qualified for the finals of the tournament in 16 years, but in James Rodrigues and Juan Cuadrado they had stars bursting with the exuberance of youth, coupled with the experience of stalwarts such as Mario Yepes. They stormed through the group stages despatching Greece 3-0, Ivory Coast 2-1 and rounded off the preliminary stages by hammering Japan 4-1. They then comfortably eased past Uruguay 2-0, to set up a date with the hosts in the last eight. The pictures of Escobar failed to weave any magic however and Brazil triumphed 2-1. Reports I have read of the match suggest that many observers considered the Spanish referee, Carlos Velasco Carballo, seemed to favour the home side in his decisions; not least when he disallowed a Yepes goal that would have taken the tie into extra time. Unlike in 1994 however, the team returned home as heroes, having restored footballing pride to the country. It was a far cry from the response received 20 years previously by Andres Escobar and his teammates. Although still hardly the safest place on the planet, the Colombia of 1994 was a much more dangerous place to return to after a humiliating sporting exit. In 1993, the country had the highest murder rate in the world. The twelve months between that classification and Escobar’s team returning from the USA had not seen much to change the statistic. Football however had a special place in the psyche of most Colombians, be they the penniless street ragamuffins, or the drug barons that funded many of the country’s football clubs at the time, laundering money through the turnstiles. It was this apparent sporting largesse that meant home-grown stars could be kept playing for Colombian clubs, rather than them being spirited away to the riches of European clubs. One of the most notorious of the drug barons was Pablo Escobar – no relation to Andres. 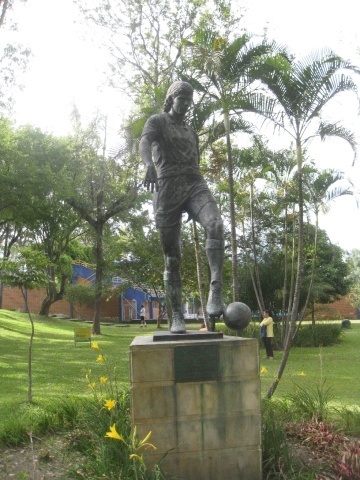 He headed the Medellin cartel and was rumoured to have funded the city’s Nacional club, for whom Andres and many other of the country’s national squad played. Notoriety and a love of football gave Pablo Escobar an almost ‘Robin Hood-esque’ persona among the Colombian poor however as he deployed sums of money providing football pitches for the poor as well as financing clubs. This was no social reformer however. Pablo Escobar’s money was built on the drug’s trade and the misery it wrought. He was responsible for the murder of judges, politicians, in excess of 500 policemen, hundreds of cartel members who crossed, and at least one football referee. The original golden generation – Carlos Velderrama et al. This was the time of the original Colombian ‘golden’ generation. Strawberry blonde playmaker Carlos Valderrama, striker Faustino Asprilla, later to star with Newcastle and Parma, Scorpion-kicking goalkeeper Rene Higuita and Freddy Rincon – as well as Escobar – were all names familiar to football’s cognicenti. As national manager Francisco Maturana, who also managed Nacional for some time explained, “Two factors converged. One, we had exceptionally good players. Two, we had the money to keep our good players. The introduction of drug money in soccer allowed us to bring in great foreign players. We were living in a violent time, in a country fraught with social problems that could not be divorced from football. The drug trade is an octopus.” This was just one example of the intertwined relationship s between organised crime and football in Colombia, but more of that later. Not unlike the Cote d’Ivoire team of recent times, the Colombian national team were seen as a unifying symbol of a country torn asunder by crime, corruption and social problems. When Andres Escobar left to lead his team to the USA, he remarked that “We are all working for a common cause – to make our country proud. We’re trying to not focus on the violence. I find motivation in the good things to come. I try to read a bit of the Bible each day. My bookmarks are two photos. One of my late mother, the other of my fiancée.” Such an attitude however could not insulate the squad from malevolent influences back home. I’ve read reports that say it was Andres Escobar who rallied his team when many wanted to return home in fear. If such stories are true, it only underscores the respect within which the captain was held. Even so, midfielder Gabriel Gomez simply refused to play. Despite Escobar’s principled and noble stand ironically, and tragically, it was he who was to pay the ultimate price. The truth of such things will now probably never be fully known, but I’ve seen reports and assertions alleging there were large amounts of ‘dirty’ money riding on the result of the game. Whilst US mafiosi were backing the hosts, Colombian drug money was wagered on the Colombians. Out of such rumours does evidence arise, and Escobar’s own goal has become wrapped up in the mystery. In a scenario where death threats and money may hold more sway than tactics and technique, it’s easy to view things through a distorted lens and not be able to discern fact from fiction. Were the teams ‘got at’ by competing powerful forces? Some would argue it was so. 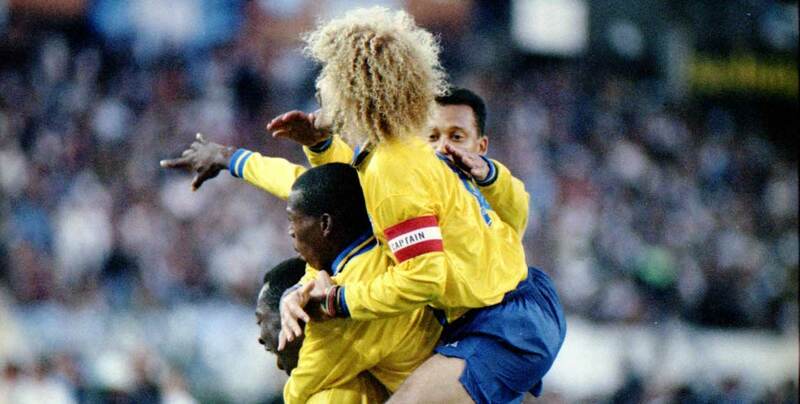 Reports have suggested that the elegant Valderrama hardly seemed capable of completing the most straightforward of passes, whilst American defender Fernando Clavijo is reported as describing Asprilla as being disinterested, saying that “he didn’t even try.” Following the game, Asprilla is rumoured to have told reporters, “It’s not the end of the world.” It was however the beginning of the end for Andres Escobar. 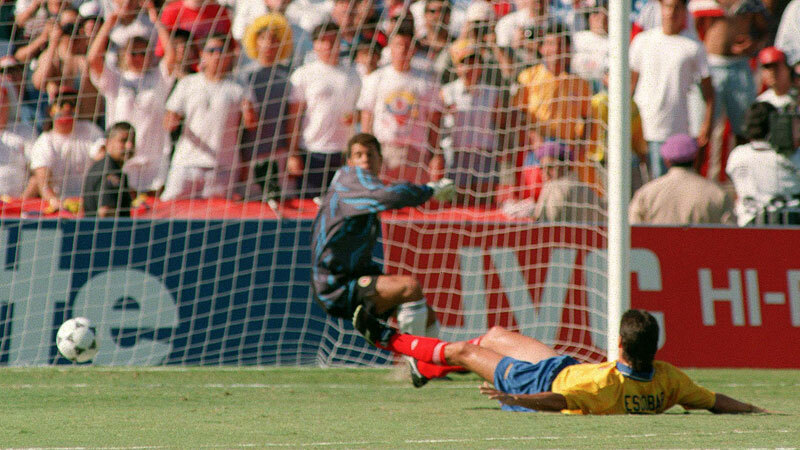 After the Colombians were eliminated from the tournament, Andres Escobar reportedly changed plans for a holiday travelling across America, believing that he needed to go back to Colombia to make his peace with his country. It’s been reported that he never watched a replay of the incident that may have led to him losing his life, although surely such an urbane man would have a pretty sound idea of the emotional outburst it would have caused. Friends had reservations about an early return, advising that the streets held many dangers, and things in Colombia at the time were rarely resolved merely with fists. Maturana relays however that Escobar would not be dissuaded saying, “No I must show face to my people.” It was a typically brave, but ultimately fatal decision. Although witnesses attribute the shooting to a drunken row in the bar, others have different theories. Police in Medellin police have reportedly said that a lot of the cartel’s ‘cocaine’ funds were bet on the expected Colombian win. When that failed to arrive, someone was always going to be called to account. If so, the dangerous combination of drugs, money and football was the lethal cocktail involved. The number plate of a car in which the killer(s) – some said one who fired six shots, whilst others recall two, with twelve shots being despatched into Escobar – fled the scene, was passed to the police by two witnesses. The number was linked to the Gallon brothers, renegade former members of Pablo Escobar’s cartel. In the 2010 ESPN documentary called ‘The Two Escobars’ a former henchman of Pablo Escobar, Jhon Jairo Velásquez Vásquez, alleged that a sum in the region of $3 million was paid to persuade the prosecutor’s office to focus their investigation on one of the bodyguards. Later, Humberto Castro Muñoz confessed to Escobar’s murder and was sentenced to 43 years in prison. He served only 11 however, before being released for good behaviour. The Gallóns were cleared of any wrongdoing. “Andrés’s mistake was talking back to these guys,” Velásquez said in the US documentary. “It had nothing to do with betting. It was a fight, that’s all.” It hardly appears to be conclusive evidence. Colombia fans show their support the the late Escobar. Twenty years later, as Colombia prepared to face Brazil, it was still unclear how accurate Mataruna’s words had been. 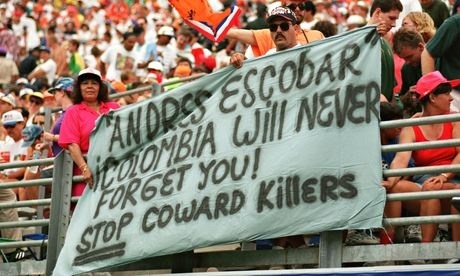 Ordinary people and fans had produced social media campaigns to honour Andrers Escobar, and the carrying of his picture to games is a touching tribute. Any commemoration by the Colombian federation or even Fifa was however was so low key – if there even was one – that I can find no reference to it all. A few days before his murder, Escobar wrote these simple, but poignant, words in the Colombian newspaper El Tiempe: “Life doesn’t end here. We have to go on. Life cannot end here. No matter how difficult, we must stand back up. We only have two options: either allow anger to paralyse us and the violence continues, or we overcome and try our best to help others. It’s our choice. Let us please maintain respect. My warmest regards to everyone. It’s been a most amazing and rare experience. We’ll see each other again soon because life does not end here.” He was talking about the loss of a football game, but his words could just as easily reflect the fight that Colombia itself was facing. There’s a statue of Andrew Escobar in the centre of Medillin. It stands as a memorial to the tragic loss of life of an apparently thoroughly decent man, who just happened to excel at football. It may reflect the death of someone caught up in something much bigger and more malevolent than any of us can probably imagine, or simply the consequence of a drunken encounter. The late Liverpool manager Bill Shankley once famously said that, “Some people believe football is a matter of life and death, I am very disappointed with that attitude. I can assure you it is much, much more important than that.” Whilst the old sage of Anfield was right about so many things in the game, I’m pretty confident he’d be happy to review his opinion when referring to the fate of Andres Escobar. (This All Blue Daze article was originally produced for ‘thefootballpink’ website).